Growing ridership by 1.3 million rides in 2011, Madison, Wis.-based Metro Transit shattered a 40-year ridership record by falling just short of 15 million rides. 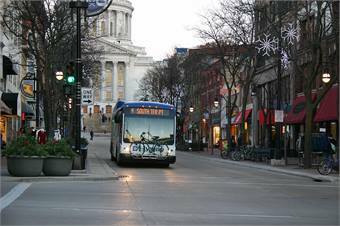 Kamp said that Metro Transit will receive APTA’s Outstanding Public Transportation System Award for an agency with more than four million, fewer than 20 million passenger trips annually, in part due to its partners and employees. Kamp also attributes Metro’s success to being in a college town, citing a couple of well-publicized studies reporting that the so-called “Generation Y” is both delaying getting their driver’s license as well as shrinking the amount of vehicle miles traveled, overall. “There is just a growing awareness, and we have to be careful of how we use our land, our limited fuel and other scarce resources. I think young people get that,” he said. With that, Metro is also making it easier to travel on its system through the use of Google Maps and a smartphone app, which help riders get to and from their stops and find out where their bus is.